Now that I’ve wrapped up the software project that’s been dominating my time and prompted me to skip this year’s low-carb cruise, I finally got around to finishing Denise Minger’s first book, Death by Food Pyramid. Wow. Let’s just say it was worth the wait. The book’s subtitle is How Shoddy Science, Sketchy Politics and Shady Special Interests Ruined Your Health … and How to Reclaim It, which pretty much describes the story presented in the 200-plus pages. As she explained during her presentation on the low-carb cruise a couple of years ago, Minger isn’t a low-carber and doesn’t promote any particular diet other than a nutrient-dense diet. So although there’s a section on the commonalities of diets shown to improve health, this isn’t a diet book. It’s more of a history book, and the details Minger dug up about how the Food Pyramid and the USDA’s dietary guidelines were developed are fascinating. 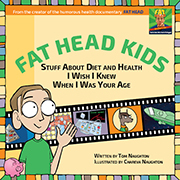 In Fat Head, I gave a (very) brief version of the story in the section that began with Ancel Keys, continued through the McGovern Committee hearings and ended with the USDA Food Pyramid. Death by Food Pyramid presents the much deeper, much richer version. I learned quite a bit of new information about how the Food Pyramid came to be. Reading the story in such detail also prompted more than a few head-bang-on-desk moments. Unlike previous food guides, Light’s version cracked down ruthlessly on empty calories and health-depleting junk food. The new guide’s base was a safari through the produce department – five to nine servings of fresh fruits and vegetables each day. “Protein foods” like meats, eggs, nuts and beans came in at five to seven ounces daily; for dairy, two to three servings were advised. The guide kept sugar well below 10 percent of total calories and strictly limited refined carbohydrates, with white-flour products like crackers, bagels, and bread rolls shoved into the guide’s no-bueno zone alongside candy and junk food. And the kicker: grains were pruned down to a maximum of two to three servings per day, always in whole form. … Satisfied that their recommendations were scientifically sound and economically feasible, Light’s team shipped the new food guide off to the Secretary of Agriculture’s office for review. And that’s when the trouble began. Well, I guess trouble is what you get when you send the Secretary of Monsanto … er, excuse me, the Secretary of Agriculture a document suggesting people limit their grain consumption. When Light received the (ahem) edited version of her guidelines back from the USDA, they were a grain-promoting perversion of what she’d originally submitted. Horrified, Light explained that “no one needs that much bread and cereal in a day unless they are longshoremen or football players” and warned that the six-to-eleven servings of grain per day recommended by the USDA could spark epidemics of obesity and diabetes. The only justification she’d been given was that the changes would help curb the cost of the food stamp program: fruits and vegetables were expensive, the head of Light’s division explained – and from a nutritional standpoint, the USDA considered them somewhat interchangeable with grains. Emphasizing the latter in the American diet would help food assistance programs stay within budget. How’s that for typical government logic? We have a government-subsidized food stamp program, but paying for foods that are actually good for people is too expensive, so we’ll just declare cheap grains to be a health food in our new guidelines. Later, of course, we’ll impose those guidelines on schools and other government facilities. Let’s make everyone eat survival food for poor people. Yes, I know: you really want to bang your head on your desk right now … and we’re only up to page 24 in the book. The USDA takes on the Darth Vader role again later in a chapter about trans fats. After recounting the history of Crisco and how it triumphed over lard in the American kitchen (thanks in part to Upton Sinclair scaring people away from meat products with his fictional book The Jungle), Minger explains that scientists began recognizing the possible health hazards of hydrogenated oils as far back as the 1950s. By the 1990s, the evidence was clear: trans fats were bad news for health. The food pyramid’s pamphlet – beneath the heading “Are some types of fat worse than others?” – stated only to limit saturated fat to less than 10 percent of total calories because it could raise cholesterol and cause heart disease … And worse, the pamphlet specifically advised consumers to tilt their fat choices towards margarines with “vegetable oil” listed as their first ingredient, effectively steering folks toward some of the richest sources of trans fat in existence. Boy, if only we could put the feds in charge of everyone’s health care. Given our government’s history in health matters, I know they’d do a wonderful job. If you’ve read her takedown of the China Study (among many other excellent posts) you know Minger is a science geek. 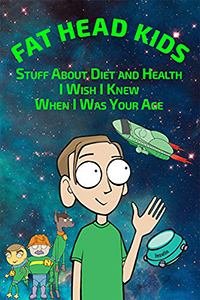 So not surprisingly, she devotes an early chapter to explaining health science so the reader can understand how bad science led to the anti-fat, anti-cholesterol beliefs that still plague our dietary recommendations today. As you’d expect, the Shoddy Science chapters feature our old friend Ancel Keys, but Minger’s portrayal of the man is much more nuanced (and therefore more accurate) than the brief treatment I gave him in Fat Head. While many of us consider Keys a villain and John Yudkin (the anti-sugar researcher who wrote Pure, White and Deadly) a hero, Minger sees them more as mirror images of each other. Both were egotistical, both relied on observational and sometimes cherry-picked evidence when it suited them, both spent a lot of time and energy insulting each other, and both also conducted some good, solid science during their long careers. Here’s the problem with the theories of both Yudkin and Keys: they each tried to incriminate a single macronutrient without considering the bigger picture. This type of tunnel vision still infects the research world today. Indeed, the context in which saturated fat and sugar are consumed can determine their ultimate effects on one’s health. For example, saturated fat may be benign in diets free from industrially processed foods… But add it to a diet swimming in refined grains, excess calories and high fructose corn syrup, and it might act out of character in health-harming ways. Similarly, it’s possible that sugar unleashes its most vicious damage in the context of our modern, highly processed diet. Minger goes on to cite research suggesting that saturated fat only becomes harmful when it’s dumped into a metabolic soup of inflammation and excess carbohydrates. So take a bit of saturated fat and mix it up with inflammation-producing refined grains and inflammation-producing vegetable oils – in other words, consume the diet the USDA was busy promoting as healthy – and you’ve set yourself up for trouble … or Death by Food Pyramid. In a later chapter, Minger examines three of the popular diets that have proven their power to help people overcome health problems – whole food plant-based, Mediterranean, and paleo/primal – and highlights their similarities. All include whole, unprocessed foods such as tubers, vegetables and low-glycemic fruits. All exclude sugar, refined grains and processed vegetable oils. In other words, all three return us to something closer to our ancestral diets – at least if our starting point is the Standard American Diet. Minger doesn’t pronounce any diet the winner of the health sweepstakes. In a brief chapter about the work of Dr. Weston A. Price, she points out that he found people have thrived on a variety of diets around the world: ancestral diets in Switzerland were rich in grass-fed dairy products; Native Americans in the Rocky Mountain regions lived largely on wild game (eating nose to tail and often discarding much of the muscle meat); Inuits and other northern peoples consumed a diet rich in seafood; Polynesians based their diets on seafood, fruit and taro; tribes in eastern Africa consumed sweet potatoes and whatever animals they could hunt or domesticate; Indians of the Andes ate potatoes, llamas, fish and kelp. Dr. Price found that healthy people around the world didn’t consume any particular ratio of carbohydrates to protein to fats. Carbohydrates dominated some ancestral diets and were nearly non-existent in others. What Price did find was that all the ancestral diets were nutrient-dense and based on whole, unprocessed foods. And not one of them looked anything like the USDA Food Pyramid. If you choose to put a label on your diet, make sure it doesn’t undergo a sneaky “mission creep” into the realm of your self-identity. Your current food choices may be low-carb, or low-fat, or plant-based, or any other number of descriptions – but you are not low-carb; you are not lowfat; you are not plant-based. You’re a human being trying to make choices that best serve you and your specific goals at this point in time. You are not identified by the foods you eat. You are not a slave to an ideology. Make your diet work for you; don’t work for you diet. Wise words from such a young author. I expect we’ll read many more wise words from Minger in the years to come. In the meantime, this is an excellent book to add to your library. But try to avoid banging your head on your desk while reading those chapters about the USDA. Upton Sinclair wrote The Jungle not Sinclair Lewis. I guess it really doesn’t matter. It does matter, and I just corrected it. Nice review. I concur it was a good read. Well done Denise Minger. Sorry she doesn’t Tweet much. To echo Tom’s praise, she’s a wise young woman. Thank you for the review; I’ve had my copy for awhile and this inspires me to get it out of the pile. There’s a lot of books out there taking the line you’ve been holding for quite awhile now. One with a terrible title, but some very clear writing is The Blood Code. Maurer spoke at Paleo FX recently. Her takedown of The China Study was brilliant, and her calm, respectful, professional and detailed responses to Campbell’s rebuttals were awe-inspiring. “Carbohydrates… were nearly non-existent in others.” Assuming this refers to Inuit and Masai, which it most often does, I think Duck Dodgers already debunked this claim. My only beef here is with the “nearly non-existent”. Besides that, good job. Yeah, that was interesting stuff about the animal starch. Nearly non-existent in terms of plant starches, but Duck Dodgers makes a credible case that the Inuits weren’t as low-carb as we’ve assumed. His case is not that credible: Dr Eades demolished it thoroughly. The speed at which glycogen decays means that it is effectively unavailable within a minute of an animal’s death. So when Inuits kill and eat animals in zero-degree weather, they’re consuming meats and organs fairly high in glycogen. I’m sure there are going to be a lot of “Jimmy Moore!” comments regarding that last bit, and I will say that I do check his site every day along with yours, but when I click over to that tab, I immediately hit the “Page Down” key, so that the giant “LOW CARB” logo doesn’t give any onlookers the wrong idea. Intent is irrelevant. You may think CSPI is well intentioned, and someone else may insist they are smooth talking shysters. Until humans become skilled at mind reading, that debate is irresolvable. Better to judge them by their actions. Given the trans fat debacle and the arrogance of their incessant calls for government intervention, it is difficult, at least for me, to think of CSPI as anything but a bunch of douches. Yes. A bully with “good intentions” is still just a bully. I second that emotion. Government bullies are usually convinced they’re bullying you for your own good. They’re not the government, but they lobby for government to get involved whenever possible. Great, timely review Tom. Just got this book from the library after a month wait and I can hardly put it down. I can already tell that I’ll be buying a copy to put next to Taubes on my shelf. Who’d-a-thunk a history book about dietary policy would be a page-turner? But it is. Thanks for the review. The Jungle was written by Upton Sinclair. Yee-ikes. That’s what happens when I type from memory. Thanks for the heads up. Programming is a good way to make a living, but I wouldn’t spend 40 hours per week doing it just for fun. Oh my god, yes! I know your intent of this comment wasn’t to help me validate my thoughts on this, but I 100% agree, and I felt like an outlier in thinking like this. I constantly see articles about programming on news websites that I visit, and I always skip them because I’ve already done my time, and don’t want to think about it anymore past work hours. Same with meeting other programmers. They usually want to “talk shop”, and I try my best to steer the conversation towards more fluffy fun stuff. 100% agree with this. People always assume that because I’m a programmer that I would *want* to do it in my free time. Ummm, no thanks. That is because you don’t know “the demoscene”. What can a ninja level programmer do if you give them a 4kb file size limitation to work with? Well, this for an example. Including sound, the guys make 1kb synthesizers and everything is running realtime. The file in its 3.8kb glory can be downloaded from http://www.pouet.net and http://www.scene.org But you better not go there, you will never leave again. I find her writing both entertaining and educational and enjoyed the book tremendously. Same here. Good research, fascinating history, but she’s also quite a talented wordsmith. It takes a talented writer to make statistics interesting reading. I read bits and pieces of her China Study takedown so “Death by Food Pyramid” was my first prolonged exposure to her writing. Good stuff. Excellent book. But the recent Big Fat Surprise….devastating. I agree. 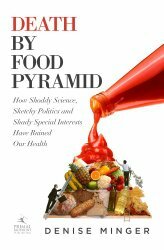 I liked “Death by Food Pyramid” and recommend it. “Big Fat Surprise” is even better. “Perfect Health Diet” is also outstanding and even tells you what to do personally to bring about better health. There is just so much conflicting information and bias out there that I can understand people who don’t have health issues yet, just throwing up their hands and following the “experts”. I love stories about government incompetence, so this sounds right up my alley. I could tell Denise was a special little gem when I listened to her show as guest host of the LLVLC show, so I am excited to crack open her book. I just have to find a way to read it while simultaneously reading the Perfect Health Diet, Grain Brain, Nutrition and Physical Degeneration, and about 10 others! You read like I read. I’m trying to discipline myself to pound through them one at a time. The special gem was our dinner table on the low-carb cruise two years ago, along with Chris Masterjohn, Dr. John Briffa and Dr. William Davis. Those were some interesting conversations. Great review, the book is on my to-read list. Does it provide any more information than Taube’s book? One tiny issue I have with many recent (paleo/low carb/nutrition) books is that they metrely repeat the arguments made by the others years ago. Yes, her history of Ancel Keys, the McGovern Committee hearings, the Food Pyramid, etc., includes quite a bit of information not found in GCBC. A hell of an excellent post, Tom. I’ll be buying the book. I only use Crisco on my face: keeps my skin soft and clear, zaps blemishes and keeps this 65 year old looking 45! Guerlain Orchidee Imperiale Cream Next Generation, $410!!! Now I’m wondering if your skin has low HDL. I’m sure it’s the soy and palm oils. I used to use coconut oil but it’s too unstable and messy in summer. Are you thinking that Crisco doesn’t get into your body if you apply it to your skin? I doubt it; the molecular structure would be too large for that kind of penetration. If you want to understand what goes on in politics, Dr. Sapolsky’s Human Behavioral Biology gives a fundamental picture. Picture groups of humans as baboons in a struggle for dominance. Stanford has released a the lectures from the Stanford course “Human Behavioral Biology” which is available on the web or in iTunes etcetera. In case your Google fu is defective here is the reading list. Not to mention his field work with baboons. This is a good book on the expose of the collusion of the government and big business. It is also helpful in explaining how studies are done and the value of different types of studies. It’s sad that after doing such a good job explaining the importance of proper studies and science in the selection of how one should eat, Minger concluded the book with recommendations based on her personal experience, and logical analysis along with anecdotal evidence, which she accurately states indicates no cause and effect relationship. While Minger does a good job of catalogging the history of the food pyramid she loses me when she advocates Weston Price as an expert on nutrition; he was a dentist who died in 1948 and was interested in how cavities formed in your teeth.. The Weston A Price was founded in 1999 by Sally Fallon. It is supported mainly by huge factory farming companies. There is no mention of the scientific presented by Dr. Michael Greger. Dr Joel Furhman, Dr. Caldwell Essylstyn, Jr is never mentioned and neither is Dr McDougll. All of these Doctors recommend a Whole Food, Plant based lifestyle.